Administrator Bridenstine chats with a couple of our astronauts … A massive dust storm on Mars … And astronauts at work outside the space station … a few of the stories to tell you about – This Week at NASA! 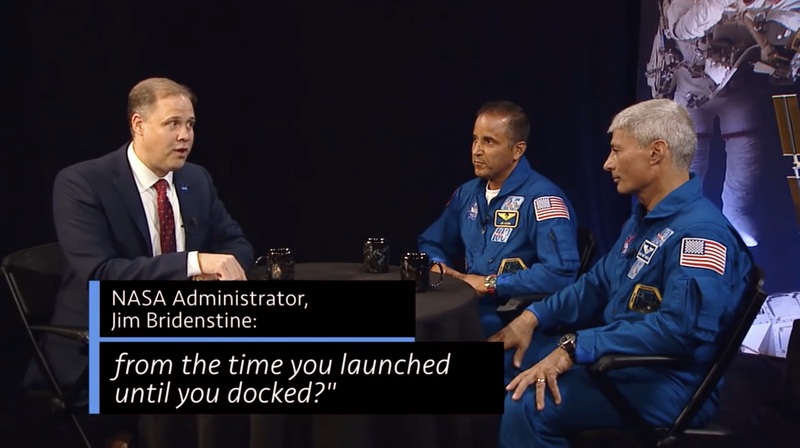 During a recent visit to NASA headquarters our astronauts Joe Acaba and Mark Vande Hei sat down for an informal Q&A session with Administrator Jim Bridenstine – and responded to some questions from the agency’s social media followers. The astronauts, who returned from the International Space Station in late February, talked about the station’s role as a platform to help us live and work in space. The cutting-edge research and technology development on the station is helping prepare our astronauts to take the next giant leap in human space exploration. The agency plans to return to the Moon and eventually send humans to Mars and destinations beyond. One of the most intense and massive dust storms ever observed on Mars is affecting our Opportunity rover, but also presents a window of scientific study for four other NASA spacecraft. Scientists hope to collect data on the storm with our three orbiters, as well as our Curiosity rover on the surface. At one point it was estimated that the storm covered 14-million square miles of Martian surface – about a quarter of the planet — and was still growing. During a June 14 spacewalk outside the space station, astronauts Drew Feustel and Ricky Arnold installed high-definition cameras to provide enhanced views of approaching SpaceX Crew Dragon and Boeing Starliner commercial crew spacecraft, that will soon begin launching from American soil. The pair also worked on several other tasks during the spacewalk, which helped move Feustel past Peggy Whitson into third place on the list for cumulative time spent spacewalking. Whitson, who still holds the NASA record for the most cumulative time in space, retired from the agency, effective June 15. Selected as an astronaut in 1996, her 665 days in space included three long-duration missions to the International Space Station, during which she became the station’s first NASA science officer, first female commander, and also claimed the title for most spacewalks by a female, with ten. On June 12 our remotely-piloted Ikhana aircraft successfully flew its first mission in the National Airspace System without a safety chase aircraft. The historic flight in the skies over southern and central California moves the U.S. a step closer to normalizing unmanned commercial and private aircraft operations in the airspace – which could potentially lead to a variety of services, from monitoring and fighting forest fires, to providing new emergency search and rescue operations.